LISBON, 1 December 2018 – AirAsia has been named the World’s Leading Low-Cost Airline for the sixth year running at the World Travel Awards (WTA) Grand Final. AirAsia Group Head of Cabin Crew Suhaila Hassan (centre left) and AirAsia Group Head of Communications Audrey Progastama Petriny (centre) accepted the World’s Leading Low-Cost Airline and World’s Leading Low-Cost Airline Cabin Crew awards from President & Founder of World Travel Awards Graham Cooke (centre right), flanked by AirAsia cabin crew. AirAsia emerged top in the category after receiving the most votes from travellers and industry executives, ahead of Southwest Airlines, JetBlue, Ryanair, easyJet, Jetstar Airways, Norwegian Air, West Air, flydubai, Air Arabia, flynas, and fastjet. 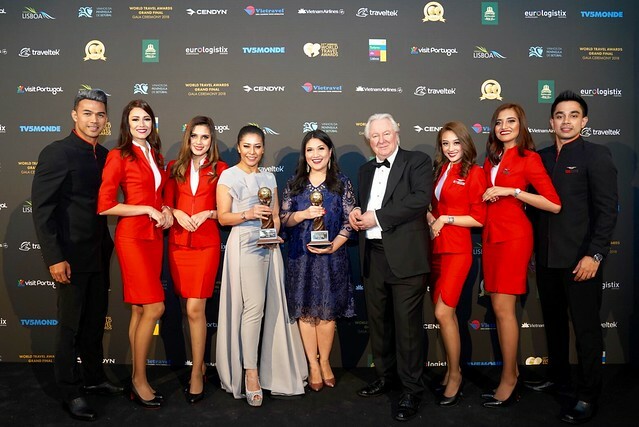 The airline also took home the award for World’s Leading Low-Cost Airline Cabin Crew for the second time in a row, beating Southwest Airlines, JetBlue, Ryanair, easyJet, Jetstar Airways, Norwegian Air, West Air, flydubai, Air Arabia, flynas, fastjet, Kulula and Mango. For the full release, please click the following link for English.